A few weeks ago, Larry Ellison threw a party in San Francisco for the premiere of “The Wind Gods: 33rd America’s Cup,” a documentary that also called attention to a whole lot of high-tech sailing set to take place starting in July in the San Francisco Bay. But that 34th America’s Cup has been under some level of scrutiny of late, ever since an accident the day after the screening that resulted in the drowning death of a member of the Artemis Racing team, after its boat dramatically capsized in the San Francisco Bay. 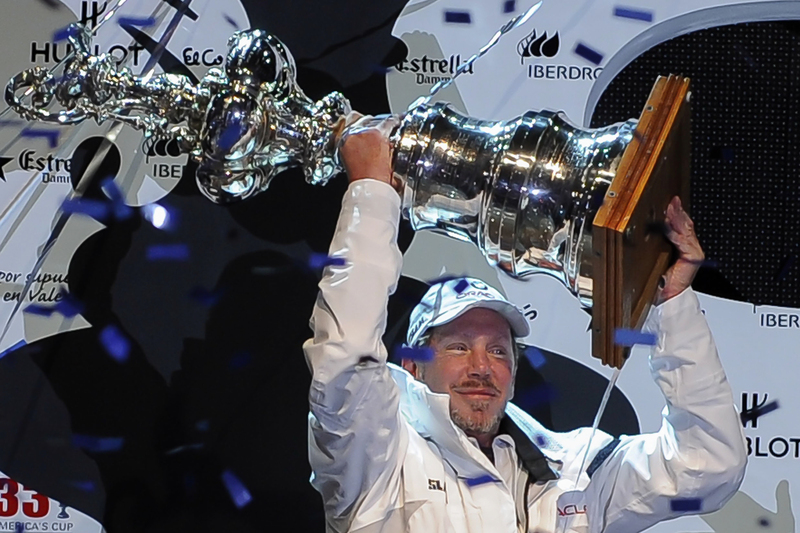 This documentary certainly isn’t a 3-D spectacular, but it is a pretty dramatic paean to how the tech mogul’s sailing team, BMW-Oracle, after a decade of failed attempts, finally snatched America’s Cup in 2010 in Valencia, Spain, back from the Swiss team Alinghi and its leader Ernesto Bertarelli, a former Ellison friend. Emphasis on former, according to “The Wind Gods,” narrated in basso-profondo tones by actor Jeremy Irons and in the construct of the underdog — in this unlikely case, Ellison — against the villainous snob from Europe. This despite the huge advantage BMW-Oracle had via its USA-17 trimaran, with its breathtakingly massive, fabulously computerized rigid-wing sail, for which price was apparently no object. Ellison was full of bon mots like this in “The Wind Gods” and also at the event, held at the new America’s Cup pavilion on the Bay and chock full of the Oracle team members — such as skipper James Spithill — as well as the enormous silver cup itself that now has a new carbon-fiber base similar to the materials the boats are made of. After the panel, I did an interview with Ellison about the upcoming defense by Oracle Team USA, an effort that has been seen quite a bit of controversy over the dangers of the new boats in the upcoming race, called AC72s, which are 131 feet high, 46 feet across and 72 feet long. 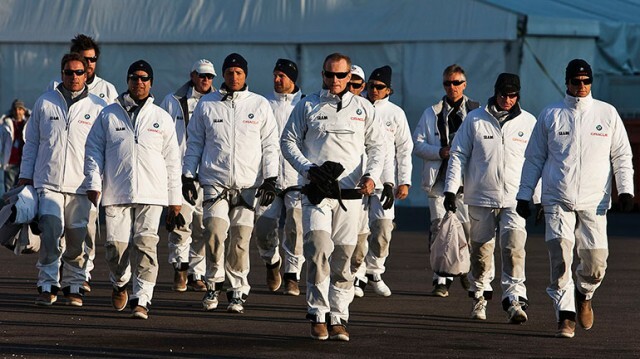 Due to the high costs, though, there will only be the three teams that will compete in the Louis Vuitton Cup — also known as the America’s Cup Defender Series — that starts July 4, rather than more than a dozen that are more typical. Oracle Team USA does not compete in this part of the series. It will face the winner in the finals, which will take place from September 7 to 21. Ellison is certainly not sanguine about the issues raised by the hyped-up boats and the extreme pushing of the edge, which in truth have been a reality since America’s Cup’s very beginnings. But the unusual, perhaps never-to-be-seen-again, nature of the boat design is part of the reason for the film about the 2010 race, he said. Since the documentary needed to be only 56 minutes for television, a lot about the boat’s technology was left on the cutting room floor. “The engineering is phenomenal, there are 2,000 sensors on the mast,” said Ellison, who noted the new one for the upcoming race will also be outfitted from back to front with cameras and microphones. “It’s primarily for the television audience,” he said, due to the efforts to make this America’s Cup, which will take place in perhaps the most picturesque setting under the Golden Gate Bridge, more interesting to viewers (races will be shown on NBC and elsewhere). Ellison said he hoped that people not particularly interested in sailing will find the races gripping, although perhaps not in the same way he did when he first learned to sail taking lessons at the University of California at Berkeley when he first arrived in Silicon Valley. He was instantly entranced. “I was always in love with the idea of sailing and the freedom it represents, the fact you can go anywhere with just the power of the wind,” he recalled, saying a series of National Geographic articles by Robin L. Graham about his solo 1965 sail around the world as a teenager was inspiring to him. Ellison has not decided if he will be on the AC72 — as he was at the last America’s Cup — as part of the crew in the finals. “I am not sure, but I am getting into shape in case, although it’s a chore,” said Ellison, who is working out by running and playing tennis, but still makes fun of all the various athletes — including some on his sailing team — who are on a gluten-free diet. Having already competed professionally, he said he might be satisfied to not compete himself, which does not seem very much like Larry Ellison. America’s Cup practices on the San Francisco Bay resumed this week by Oracle, as well as Luna Rossa and Emirates Team New Zealand, for the first time since the accident — but with a drop in maximum wind limits and a list of new safety requirements. Artemis, which has had a new replacement boat brought in, has not decided if it is going to compete as yet in sailing’s premier regatta. The very powerful and the very stupid have one thing in common. Instead of changing their views to fit the facts, they try to change the facts to fit their views.